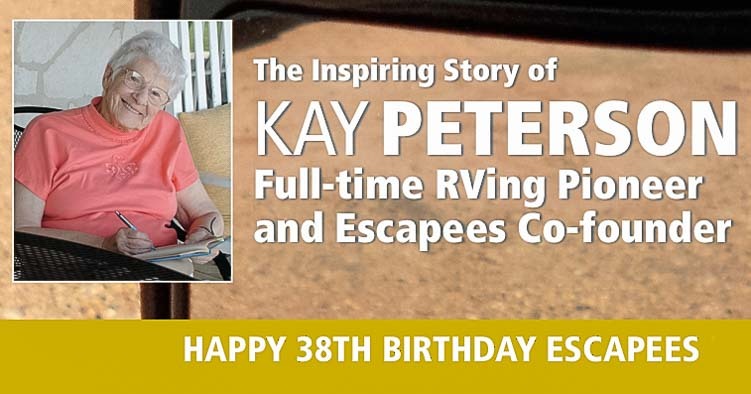 We just received the very sad news that Escapees RV Club Co-Founder Kay Peterson has died. 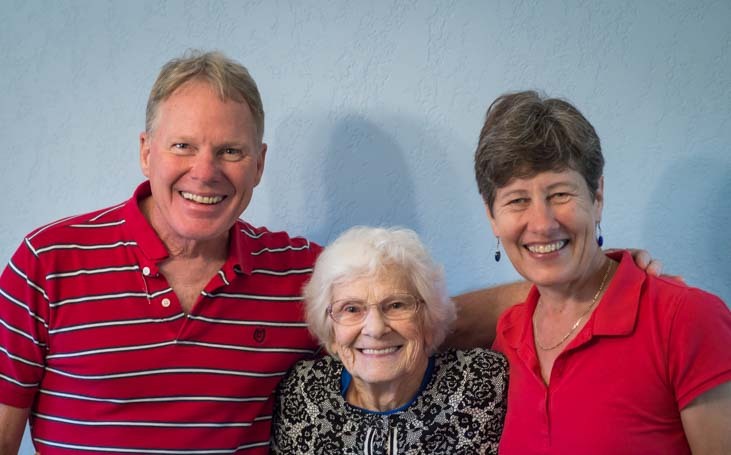 Kay was a guiding light in the RVing community for many decades, a woman who lived her dreams to the fullest, despite many seemingly impossible road blocks along the way. Nearly two years ago Mark and I were utterly blessed to spend several very memorable hours with Kay learning about the winding road she took through a fascinating life. As we all know but too often forget, “Time stops for no man,” and if there was anyone who understood the power of those words it was Kay Peterson. If you have a big dream but keep putting it off for one reason or another, Kay’s rich life offers all the inspiration you need to squash your fears and live life with gusto. For our newer readers who do not know her incredible story, we are re-publishing this post today in honor of Kay Peterson’s life. 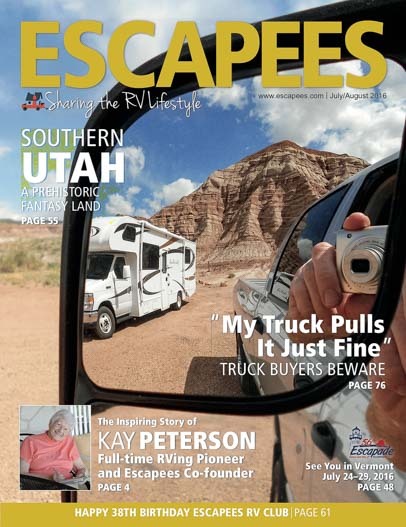 The July/August 2016 of Escapees Magazine features a lengthy article I wrote about Kay Peterson, the co-founder of Escapees RV Club and a pioneer in the full-time RV lifestyle in the 1970’s. Like many new SKPs (the Escapees RV Club nickname for the word “Escapees”), our first real evidence of being members was in receiving and reading the bi-monthly Club magazine, Escapees Magazine. We knew little else about the club when we joined, but when I saw the first issue of the thick magazine, I was struck by two things: the artistic cover photo and the very first article inside called “Thoughts for the Road” written by Kay Peterson. As the months went by and more issues arrived, I was always very taken by the images on the cover of the magazine, and I couldn’t help but sit right down and read Kay Peterson’s opening essay immediately. She always spoke of the importance of pursuing your dreams, of taking chances, of overcoming your fear of the unknown and of following your own heart. She seemed to be speaking right to us, because those topics were hot on our minds as we discovered true independence and freedom in our first few months and years on the road. And then we’d read Kay’s latest installment, and she’d remind us that too often people are held back by fear. They want to wait for a “better time” in their lives to chase their dreams, a time when they have more money, or more time, or fewer responsibilities. I was astonished that this RV club magazine would dive right into these weighty, philosophical topics, and that Kay would keep persisting, gently prodding us to think about the important things in life. Who was she, where had she come from, and what had her life been like? I wondered. At that time, we had no idea what the Escapees RV Club was all about beyond the magazine. We aren’t joiners or “club” people, and we had started RVing full-time to get away, not to become part of a social group. But the quality of the magazine and those intriguing opening essays that Kay wrote touched us both. 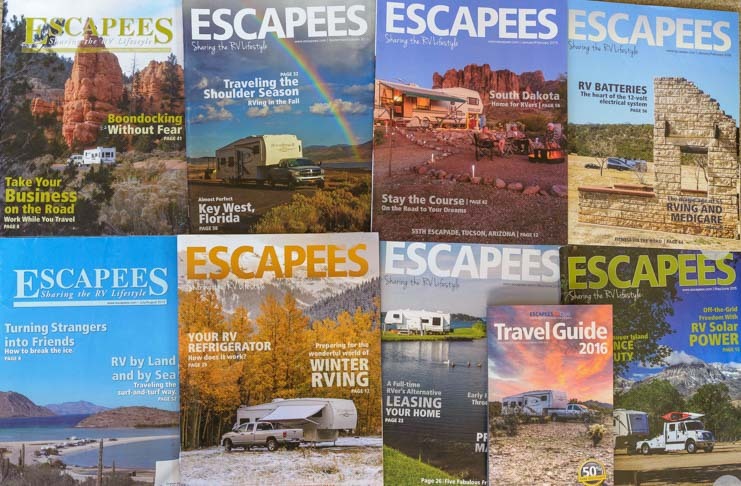 The images on the cover of Escapees Magazine were always beautiful, and the articles inside had a different thrust than other RV magazines we subscribed to that focused on RV reviews, product reviews and info about RV gear. Escapees Magazine had a lot of that stuff too, but it also went into detail about the unusual things that affect people who live on the road in their RVs full-time or for months on end. I felt an affinity with Kay Peterson right from the get-go, but when she mentioned in one of her essays that she’d gotten her start as a writer when she sent an article to Woodall’s Trailer Travel Magazine and that they responded by publishing it and sending her a check for $75, I was blown away. I had just sent an aritcle to Escapees Magazine about Goblin Valley, Utah, right in time for the Halloween issue, and they had responded by publishing it and sending me a check for $75! 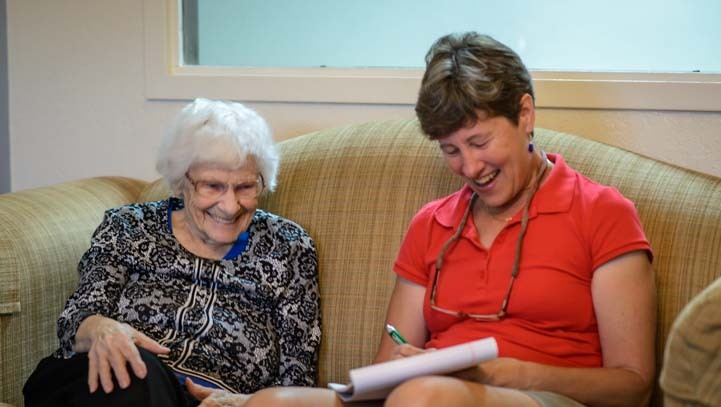 Kay’s writing, her philosophy of life, and the essence of her message stayed with me, and as I wrote more and more, on this blog and elsewhere, I often felt her influence in the back of my mind. She is a generation ahead of me in age, and she was like a guide and mentor, even though we had never met. Mark and I finally had an opportunity to meet Kay last fall when we were in Texas, and what a fabulous experience that was. She was warm, animated and downright charismatic as she told the two of us her life story. She has lived an incredible life, going through lots of twists and turns and bumps in the road on her way to many impressive achievements, and her intriguing journey continues to this day. As soon as she greeted us, I had to smile at hearing her light Boston accent. That accent is near and dear to my heart, because I grew up there, and even though I don’t have the accent and can’t mimic it, whenever I hear it spoken authentically (not the Hollywood version), it sounds like home. What was much more surprising, though, was to find out that she got her nurse’s training in the 1940’s in the exact same hospital where members of my family had been born and died in the 1960’s and 1970’s. As it turned out, Kay and I had grown up at the same end of town! I was also fascinated to learn that back in her day, the student nurses lived in dormitories at the hospital while they were in nursing school. We found we had a lot in common! For most of us born after the Great Depression and World War II, the events of the 1930’s and 40’s exist only in faded black and white photos and jittery newsreels. Even though, for me and Mark, the war ended just 10-15 years before we were born, about the same distance back as 9/11 is today, it is impossible for us to understand what life was really like back then. But as Kay described her childhood and youth to us, that era suddenly came to life in vivid color. She came of age as the war was ending, and her young adulthood was intricately tied to and shaped by the events around her. It’s easy to take society’s changes from the Women’s Liberation movement for granted now. Having forgotten just how much the world has changed in the past 65 years, Mark and I were both very affected by the movie Philomena, which is about a young woman who was forced to live in a Catholic home for unwed mothers and give up her baby for adoption in Ireland in the 1950’s. But as we listened to Kay’s story, we were shocked to hear that tale told again, but this time in the 1940’s in America. Likewise, we have always known that tuberculosis is a terrible disease, but we had no idea that until the vaccine for it was developed and made available, patients were isolated from society in institutions to prevent spreading it further. Most didn’t make it out alive, but Kay did. 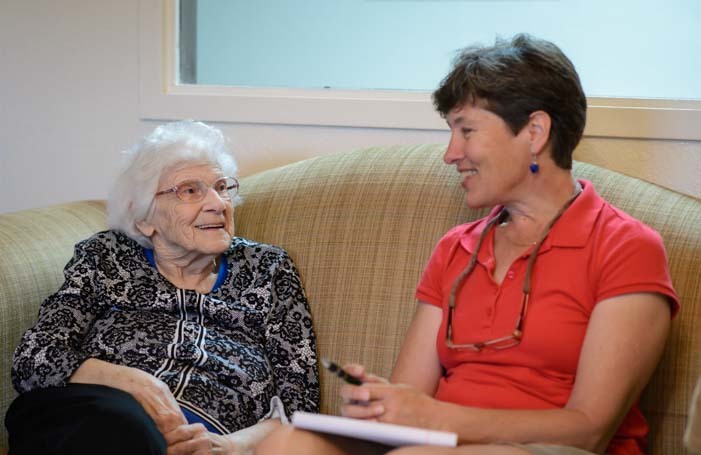 Hearing Kay’s tales of her past, we not only saw how perseverance and optimism can lead to a fulfilling and rich life, as happened for her, but we got a history lesson as well. I scribbled notes furiously but was captivated when I read her autobiography later! Kay tells her life story in riveting detail in her book, Beating the Odds, published in 2013. After Mark and I spent several hours listening to her story in person during the course of two different visits, we absolutely devoured her book. It is an inspiring tale of overcoming and becoming that we couldn’t put down. Kay faced many brutal hardships, from poverty to an abusive husband, and she struggled against many agonizing obstacles in her early years, including a life threatening disease, but she never lost her belief that life could be better. A turning point came for her when her beloved grandmother died and she realized, while going through her belongings, that this woman she had always adored had lived more timidly than bravely and had died without ever allowing herself to be bold enough to insist on living her dreams. At that moment, Kay vowed never to fall prey to fear like that herself. 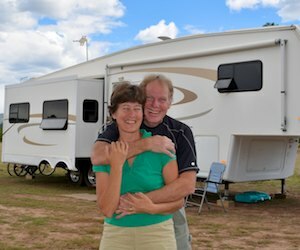 Upon meeting Joe Peterson, she found her soulmate, and the two of them began to make history together when, at age 43, they joined the tiny ranks of people who were living in their RVs full-time in the 1970’s. Joe had the ideal mobile occupation as a “tramp” electrician, and in a few short years, she became a writer for both Woodall’s Trailer Travel Magazine and the Snowbird Newsletter. These writing gigs led to her starting an RV journal of her own, which ultimately became Escapees Magazine. From that came the founding of the Escapees RV Club in 1978. 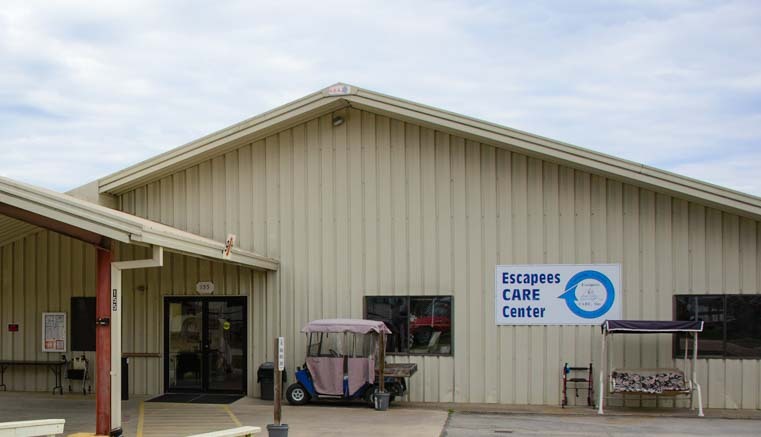 The rest is history, as Escapees RV Club has grown in all kinds of creative ways since its inception. But the most fascinating thing for me is that Kay Peterson has grown too. Besides co-founding Escapees RV Club, overseeing the development of an outstanding RV magazine, and creating the first of its kind assisted living center for RVers (Escapees CARE or Continuing Assistance for Retired Escapees), she has published a slew of books, including the first book ever written about full-time RVing, called Home Is Where You Park It. This bible for full-timers was in print for 22 years until its last edition came off the presses in 1999. Her fifteen years of full-time RV travels with Joe ultimately whetted their appetities for more travel adventures and led them further afield to explorations that took them overseas to Europe, Africa, Australia, Fiji and other exotic destinations. A few years back, when she was in her mid-80’s, she mentioned in her Escapees Magazine column that she was now pursuing a dream she had held since her youth but had never made a top priority: writing a novel. Never one for mere pipe dreams, in 2013, she published 13 Days in Africa, a novel that was inspired by her own safaris in Africa. This novel was so well received that she sat down and wrote another, and this past winter, on her 89th birthday, she published the sequel called The Elephant Bond. The Escapees headquarters campus in Livingston, Texas, is so extensive they offer tours on a trolley bus!! Dramatic and poignant, her novels draw from all of her life experiences and are compelling dramas. Kay was not quite finished discovering the stories behind her characters after the second novel, however, so she is planning to turn this pair of novels, whose stories now span three continents, into a trilogy, with the publication of a third novel in the series on her agenda now! Added later: Kay completed the trilogy and published her third novel in the series, When Cultures Collide, in February 2017. Kay’s proudest accomplishment, and one which took extraordinary patience and fortitude! At the moment, however, she is attending the Escapade RV rally in Essex Junction, Vermont (held July 21-23 in 2016), and lots of lucky Escapees members are having a chance to meet her in person and listen to her wisdom at the rally. For those who have a dream — whether it’s a travel dream or lifestyle dream or something totally different — Kay stands out as one of those rare mentors who not only made their dreams a priority and made them come true, but who has consistently reached out to those around her and encouraged them to pursue their dreams as well. I highly recommend reading Kay’s autobiography, Beating the Odds, and her book of essays, Chasing Rainbows. The essays are drawn from over three decades of her inspirational Escapees Magazine articles. She offers many pearls of wisdom and gems of hope that are great reminders of how important it is not to let life pass us by. If you don’t fulfill your dreams now, when will you? Some of us prefer to live 365 days in a year crammed with as many experiences as possible. Others are content to live the same day 365 times in a row. In addition, I highly recommend that all RVers, especially those who use their RV for extended travel, join Escapees RV Club, even the “non-joiners” and non-club folk like ourselves. Of the many things that Escapees RV Club is involved in — a myriad of overnight parking options (from free sites to site ownership), an online RVers forum, RV rallies, RV education, an RV weighing program, assisted living for RVers, and a massive mail forwarding outfit — the RV advocacy work they do benefits everyone who owns an RV and is well worth supporting. This US Mail semi tractor trailer full of RVers’ mail pulls up at Escapees HQ in Texas EVERY DAY!! If you happen to join, we’d appreciate it if you’d let them know you heard about Escapees from this blog, Roads Less Traveled, as they will put a little something in our tip jar. This might sound shallow or self-serving, but the truth is that we have spent years recommending Escapees to other RVers and did so long before Escapees even knew we had a tip jar! What a special time this was – Mark, Kay and me. Also, for any Escapee with a camera or a flare for words, Escapees Magazine is always looking for photos and articles from members. Mark’s cover photo in the July/August issue (at the top of this page) is a classic example of how a beautiful photograph taken with an inexpensive point-and-shoot camera can end up on the cover. When he saw a Class C motorhome reflecting in his mirror in our truck, he grabbed the shot with the closest camera he could put his hands on, which turned out to be a cheap one he’d gotten years ago. We both then tried to improve upon his image with our fancy cameras, but gosh darn it, that little point-and-shoot got the best photo of them all. So there it is, proof positive that sometimes the best way to go is just to jump in and do it, whatever “it” is, regardless of your gear or preparation, because that first impression and rush of enthusiasm may give you the biggest return. 13 Days in Africa — A novel set in Africa about the drama that unfolds when a tourist safari is attacked. The Elephant Bond — A sequel novel that follows the characters in their next phases of life. 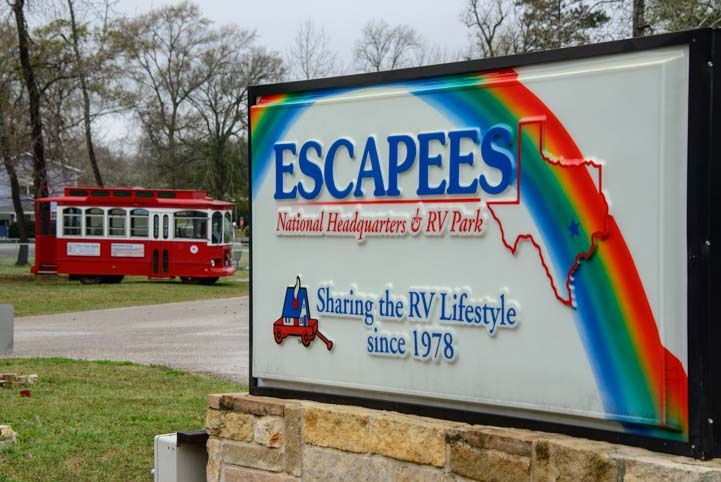 Rainbow’s End – A Visit to Escapees HQ in Livingston, TX – Our wonderful visit to Escapees HQ! 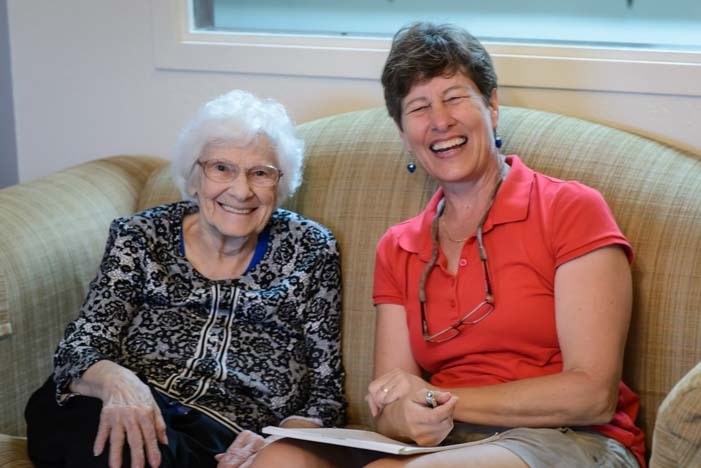 – Known as “Kay’s dream,” this assisted living center is the aspect of Escapees that makes Kay most proud! This entry was posted in The Full-time RVing & Cruising Lifestyles and tagged Full-time RV Lifestyle, Living The Dream, New, News, Non-Travel by Roads Less Traveled. Bookmark the permalink. Great article. I just read it the other day. Thanks, Scott. It was a privilege to write it. When my Escapees Magazine came I immediately read that article, but I didn’t notice that it was you who wrote it until the end. I too like to write, and as I read, I was constantly thinking to myself, “This person writes in such an engaging way–not too wordy, and yet so informative.” Then at the end, I saw it was you! So proud of you and the numerous articles you’ve had published. Keep up the great work! Thanks so much, Rhonda. I’m always noticing writing styles too, just like you, and I’ve learned a lot about writing articles from reading them. I was just mentioning to a friend yesterday that I’ve enjoyed some great writing in some really unexpected places and have learned a lot from the beautifully crafted articles in hobby magazines like Bicycling, Sailing and Runner’s World. I really appreciate your compliments. Thank you, and keep writing!! Great article and beautiful pictures, too! Thank you, Glen & Bette. It’s the enthusiasm from readers like you that make it especially meaningful for us to share what we see and learn and experience on the road. Those Escapees parks are waiting for you, and I’m sure you will have lots of fun in your travels… soon!!! I really enjoyed this article, it caused me to go and sign up for Escapees! I also found several of Kay’s older books at Amazon and bought those, along with her latest one, Chasing Rainbows. She is so very inspiring. 🙂 I will be a new part-timer next summer – a summerbird escaping the hot/humid summers of the southeast going forward, and I am just amazed at all the resources online from all of you generous full-timers out there living your wonderful adventurous lives. I can’t wait to join you! Thanks for all of the information you share, I am learning so much! Your blog is especially positive & uplifting as well as the beautiful photography. You are an inspiration. How incredible it is to pursue a lifelong dream in your 80’s. Congrats and huge kudos to you for letting nothing stop you from living a life you truly love! You are welcome, Deborah. For those of us in our mid-50’s, there’s decades of life ahead (I’m right there with ya! ), and there’s loads of life ahead for folks in their 80’s and 90’s too!